Hopwood, M.J., Cantoni, C., Clarke, J.S., Cozzi, S., Achterberg, E.P. (2017) The heterogeneous nature of Fe delivery from melting icebergs. Geochem. Persp. Let. 3, 200–209. The micronutrient iron (Fe) can be transported from marine terminating glaciers to the ocean by icebergs. There are however few observations of iceberg Fe content, and the flux of Fe from icebergs to the offshore surface ocean is poorly constrained. Here we report the dissolved Fe (DFe), total dissolvable Fe (TdFe) and ascorbic acid extractable Fe (FeAsc) sediment content of icebergs from Kongsfjorden, Svalbard. The concentrations of DFe (range 0.63 nM – 536 nM, mean 37 nM, median 6.5 nM) and TdFe (range 46 nM – 57 µM, mean 3.6 µM, median 144 nM) both demonstrated highly heterogeneous distributions and there was no significant correlation between these two fractions. FeAsc (range 0.0042 to 0.12 wt. %) was low compared to both previous measurements in Kongsfjorden and to current estimates of the global mean. FeAsc content per volume ice did however, as expected, show a significant relationship with sediment loading (which ranged from < 0.1 – 234 g L-1 of meltwater). In the Arctic, icebergs lose their sediment load faster than ice volume due to the rapid loss of basal ice after calving. We therefore suggest that the loss of basal ice is a potent mechanism for the reduction of mean TdFe and FeAsc per volume of iceberg. Delivery of TdFe and FeAsc to the ocean is thereby biased towards coastal waters where, in Kongsfjorden, DFe (18 ± 17 nM) and TdFe (mean 8.1 µM, median 3.7 µM) concentrations were already elevated. Figure 1 Surface fjord sample locations in Kongsfjorden. Figure 2 Median FeAsc (wt. %) with 25/75th (boxes) and 10/90th (whiskers) percentiles (outliers also shown) for iceberg embedded (n = 34) and iceberg surface (n = 20) sediment. Figure 3 DFe and TdFe (both nM, plotted as log10, TdFe shown minus DFe) for 28 discrete iceberg samples showed no clear relationship. Table 1 Comparing data for Kongsfjorden from this and prior work suggests a critical difference in both FeAsc (wt. %) and in the scaling of FeAsc to iceberg sediment load (g L-1 of ice melt). *The suggested 0.5 g L-1 sediment loading is used for data from Raiswell et al. (2016). **For our study, measured sediment loadings were used for each sample. As sediment-rich ice was specifically targeted, the calculated mean/median should be over-estimates. 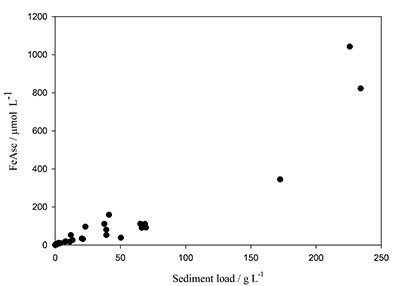 Figure 4 FeAsc (µmol L-1 melted ice) increased with sediment load (g L-1 melted ice), but it is unclear if the relationship remains linear at high (>50 g L-1) loadings. Table S-1 Analysis of Certified Reference Materials for Fe concentration (± standard deviation of at least 6 measurements). Table S-2 FeAsc concentration reported for various sediment samples collected around Kongsfjorden. For iceberg embedded sediment with sediment loadings >0.1 g L-1, FeAsc is reported both as wt. % and per volume of meltwater. Table S-3 Dissolved (<0.2 µm) Fe and total dissolvable Fe for 15 surface water samples collected in Kongsfjorden (July 2015). Table S-4 Dissolved (<0.2 µm) Fe and total dissolvable Fe for 28 randomly collected Kongsfjorden iceberg samples (July 2015). Martin, J.H., Gordon, R.M., Fitzwater, S.E. (1990) Iron in Antarctic waters. Nature 345, 156–158. De Baar, H.J.W., De Jong, J.T.M., Bakker, D.C.E., Loscher, B.M., Veth, C., Bathmann, U., Smetacek, V. (1995) Importance of iron for plankton blooms and carbon dioxide drawdown in the Southern Ocean. Nature 373, 412–415. Loscher, B.M., De Baar, H.J.W., De Jong, J.T.M., Veth, C., Dehairs, F. (1997) The distribution of Fe in the Antarctic Circumpolar Current. Deep Sea Research Part II: Topical Studies in Oceanography 44, 143–187. Hart, T.J. (1934) Discovery Reports. Discovery Reports 8, 1–268. Lin, H., Rauschenberg, S., Hexel, C.R., Shaw, T.J., Twining, B.S. (2011) Free-drifting icebergs as sources of iron to the Weddell Sea. Deep Sea Research Part II: Topical Studies in Oceanography 58, 1392–1406. Shaw, T.J., Raiswell, R., Hexel, C.R., Vu, H.P., Moore, W.S., Dudgeon, R., Smith Jr., K.L. (2011) Input, composition, and potential impact of terrigenous material from free-drifting icebergs in the Weddell Sea. Deep Sea Research Part II: Topical Studies in Oceanography 58, 1376–1383. Raiswell, R., Benning, L.G., Tranter, M., Tulaczyk, S. (2008) Bioavailable iron in the Southern Ocean: the significance of the iceberg conveyor belt. Geochemical Transactions 9, doi:10.1186/1467-4866-9-7. 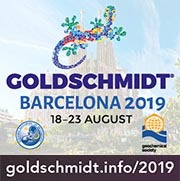 Bond, G., Heinrich, H., Broecker, W.S., Labeyrie, L., McManus, J.F., Andrews, J.T., Huon, S., Jantschik, R., Clasen, S., Simet, C., Tedesco, K., Klas, M., Bonani, G., Ivy, S. (1992) Evidence for massive discharges of icebergs into the North Atlantic ocean during the last glacial period, Nature 360, 245–249. Paolo, F.S., Fricker, H.A., Padman, L. (2015) Volume loss from Antarctic ice shelves is accelerating. Science 348, 327–331. Bamber, J., van den Broeke, M., Ettema, J., Lenaerts, J., Rignot, E. (2012) Recent large increases in freshwater fluxes from Greenland into the North Atlantic. Geophysical Research Letters 39, L19501, doi:10.1029/2012gl052552. Martin, J.H., Gordon, R.M., Fitzwater, S.E. (1991)The case for iron. Limnology and Oceanography 36, 1793–1802. Moore, C.M., Mills, M.M., Arrigo, K.R., Berman-Frank, I., Bopp, L., Boyd, P.W., Galbraith, E.D., Geider, R.J., Guieu, C., Jaccard, S.L., Jickells, T.D., La Roche, J., Lenton, T.M., Mahowald, N.M., Maranon, E., Marinov, I., Moore, J.K., Nakatsuka, T., Oschlies, A., Saito, M.A., Thingstad, T.F., Tsuda, A., Ulloa, O. (2013) Processes and patterns of oceanic nutrient limitation. Nature Geoscience 6, 701–710. Smith Jr., K.L., Robison, B.H., Helly, J.J., Kaufmann, R.S., Ruhl, H.A., Shaw, T.J., Twining, B.S., Vernet, M. (2007) Free-drifting icebergs: Hot spots of chemical and biological enrichment in the Weddell Sea. Science 317, 478–482. Schwarz, J.N., Schodlok, M.P. (2009) Impact of drifting icebergs on surface phytoplankton biomass in the Southern Ocean: Ocean colour remote sensing and in situ iceberg tracking. Deep Sea Research Part I: Oceanographic Research Papers 56, 1727–1741. Smith, K.L., Sherman, A.D., Shaw, T.J., Murray, A.E., Vernet, M., Cefarelli, A.O. (2011) Carbon export associated with free-drifting icebergs in the Southern Ocean. Deep Sea Research Part II: Topical Studies in Oceanography 58, 1485–1496. Boyd, P.W., Arrigo, K.R., Strzepek, R., Van Dijken, G.L. (2012) Mapping phytoplankton iron utilization: Insights into Southern Ocean supply mechanisms. Journal Geophysical Research: Oceans 117, doi:10.1029/2011JC007726. ). The reason for this is unclear, yet it demonstrates the difficulty in isolating the contribution of icebergs to the marine Fe cycle. Hopwood, M.J., Connelly, D.P., Arendt, K.E., Juul-Pedersen, T., Stinchcombe, M., Meire, L., Esposito, M., Krishna, R. (2016) Seasonal changes in Fe along a glaciated Greenlandic fjord. 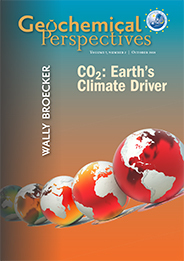 Frontiers in Earth Sciences 4, doi:10.3389/feart.2016.00015. Raiswell, R. (2011) Iceberg-hosted nanoparticulate Fe in the Southern Ocean: Mineralogy, origin, dissolution kinetics and source of bioavailable Fe. Deep Sea Research Part II: Topical Studies in Oceanography 58, 1364–1375. Raiswell, R., Hawkings, J.R., Benning, L.G., Baker, A.R., Death, R., Albani, S., Mahowald, N., Krom, M.D., Poulton, S.W., Wadham, J., Tranter, M. (2016) Potentially bioavailable iron delivery by iceberg-hosted sediments and atmospheric dust to the polar oceans. Biogeosciences 13, 3887–3900.
) with considerable uncertainty generally acknowledged in this value. Here we combine the analysis of DFe, TdFe, FeAsc and iceberg sediment load in order to provide a well constrained assessment of iceberg-Fe content within a single catchment. Raiswell, R., Vu, H.P., Brinza, L., Benning, L.G. (2010) The determination of labile Fe in ferrihydrite by ascorbic acid extraction: Methodology, dissolution kinetics and loss of solubility with age and de-watering. Chemical Geology 278, 70–79. , with leached Fe determined by measuring absorbance (λ = 562 nm) before and after the addition of ferrozine (as detailed in Supplementary Information Methods). Separately, ice samples (1–2 kg) were randomly collected from small boats (July 2015). The meltwater was acidified to pH < 2. After storage for 12 months, DFe and TdFe were measured by inductively coupled plasma mass spectroscopy (further details in Supplementary Information Methods). Dowdeswell, J.A., Dowdeswell, E.K. (1989) Debris in Icebergs and Rates of Glaci-Marine Sedimentation: Observations from Spitsbergen and a Simple Model. The Journal of Geology 97, 221–231.
. Combining FeAsc (wt. %) and sediment load (g L-1 of melted ice) produced a median FeAsc ice content of 2.5 µM. Given that our sampling strategy was to target sediment-rich ice, this should thereby be an over-estimate of median iceberg FeAsc content (L-1 of melted ice) in Kongsfjorden. The DFe and TdFe concentrations are reported in parallel for 28 randomly collected iceberg samples (Table S-4). TdFe ranged from 46 nM to 57 µM (mean 3.6 µM, median 144 nM) and the range of 0.63 nM – 536 nM for DFe was similarly broad (mean 37 nM, median 6.5 nM). 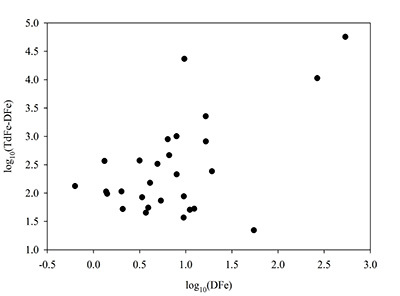 There was no significant correlation between particulate Fe (TdFe minus DFe) and DFe in these samples (Fig. 3), suggesting that DFe was not specifically associated with sediment laden ice. For comparison, DFe in surface fjord waters averaged 18 ± 17 nM (15 surface stations, Fig. 1) and TdFe ranged widely from 1.1 to 52 µM (mean 8.1 µM, median 3.7 µM) (Table S-3). Markussen, T.N., Elberling, B., Winter, C., Andersen, T.J. (2016) Flocculated meltwater particles control Arctic land-sea fluxes of labile iron. Scientific Reports 6, 24033. Enderlin, E.M., Hamilton, G.S., Straneo, F., Sutherland, D.A. (2016) Iceberg meltwater fluxes dominate the freshwater budget in Greenland’s iceberg-congested glacial fjords. Geophysical Research Letters 43, 11287–11294.
. However this assumes that changes in total iceberg Fe content are directly proportional to changes in total ice volume. Mugford, R.I., Dowdeswell, J.A. (2010) Modeling iceberg-rafted sedimentation in high-latitude fjord environments. Journal of Geophysical Research: Earth Surface 115, doi:10.1029/2009JF001564. reported a FeAsc range of 0.016–0.37 wt. % (n = 14), with a mean of 0.14 wt. % and median of 0.092 wt. %; equivalent to 1.4–33 µM, 12 µM and 8.2 µM, respectively when using the suggested mean sediment loading of 0.5 g L-1. Comparing our data both as wt. % and as a µM concentration (calculated using measured sediment loading for each sample, range 0.1–234 g L-1, Table S-2), our FeAsc (wt. %) is consistently lower. Yet our mean FeAsc per volume is much higher (51 µM), because our measured sediment loadings were often greater than the assumed mean of 0.5 g L-1. These differences generally highlight the very high spatial variability in iceberg sediment load and thus TdFe and FeAsc content even within a single fjord.
. **For our study, measured sediment loadings were used for each sample. As sediment-rich ice was specifically targeted, the calculated mean/median should be over-estimates. Hopwood, M.J., Statham, P.J., Tranter, M., Wadham, J.L. (2014) Glacial flours as a potential source of Fe(II) and Fe(III) to polar waters. Biogeochemistry 118, 443–452. ), it is not clear how storage of ice or wet sediments affects FeAsc. Hjelle, A. (1993) The geology of Svalbard: Oslo. Polarhåndbok nr. 6. Norsk Polarinstitutt, Oslo.
. Iceberg derived fluxes of TdFe and FeAsc are thereby biased towards delivery in near-shore waters and offshore fluxes are likely much less than if TdFe and FeAsc were homogeneously distributed throughout icebergs. ‘Fe’ refers to all iron phases. ‘DFe’, dissolved Fe, refers to all Fe phases <0.2 µm. ‘TdFe’ is all Fe soluble at pH < 2, inclusive of DFe and should also include any FeAsc present in unfiltered meltwater. Financial aid from the European Commission (OCEAN-CERTAIN, FP7- ENV-2013-6.1-1; no: 603773) is gratefully acknowledged. 2016 fieldwork was conducted during the CNR Dirigibilite Italia hosted project ‘pH in Svalbard’. As the rate of iceberg calving in polar seas oscillates on glacial to inter-glacial timescales (Bond et al., 1992), and recent climate change has increased the discharge of calved ice volume from both the Antarctic (Paolo et al., 2015) and Greenlandic (Bamber et al., 2012) ice sheets, Fe delivery from icebergs may also change. For example, calculated phytoplankton Fe utilisation is considerably less than present estimates of iceberg Fe supply to the Weddell Sea (Boyd et al., 2012). Icebergs contain higher Fe concentrations than seawater, both in the dissolved (<0.2 µm) (Martin et al., 1990; De Baar et al., 1995; Loscher et al., 1997) and particulate (>0.2 µm) phases (Hart, 1934; Lin et al., 2011; Shaw et al., 2011). Ice sediment content ranged from <0.1 to 234 g L-1 of meltwater, close to the 0.2–200 g L-1 range previously reported in Svalbard by Dowdeswell and Dowdeswell (1989). In two Greenlandic catchments, Ilulissat Fjord and Sermilik Fjord, overall in-fjord iceberg volume losses were estimated to be >50 % (Enderlin et al., 2016), tentatively supporting the 50 % inshore iceberg volume loss used to estimate offshore FeAsc fluxes by Raiswell et al. (2016). 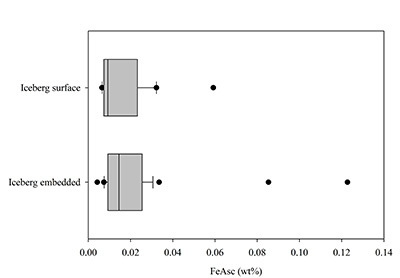 FeAsc (µmol L-1) is correlated with sediment load (Fig. 4), but assessing whether changes in sediment load affect FeAsc (wt. %) is complicated by the lack of any parameter to account for the post-calving age of ice and by the highly variable bedrock composition across Kongsfjorden (see for example Hjelle, 1993). Observations of DFe concentrations in iceberg meltwater are sparse, but the available data does suggest a heterogeneous distribution, with DFe ranging 4–600 nM in Antarctic (Lin et al., 2011) and 3–300 nM in Greenlandic (Hopwood et al., 2016) iceberg melt. For glacial flour particles of <1 mm, it has previously been demonstrated that the change in FeAsc (wt. %) with particle size is not pronounced (Hopwood et al., 2014; Raiswell et al., 2016), but this may not be the case for larger particles. The distribution of particulate Fe (which includes FeAsc) is also expected to be heterogeneous due to the presence of embedded sediment-rich layers that account for only a small fraction of total iceberg volume (Lin et al., 2011; Raiswell, 2011; Raiswell et al., 2016). As has been demonstrated in this study and elsewhere (e.g., Markussen et al., 2016), surface waters in stratified, glaciated fjords can exhibit extremely high TdFe concentrations due to the presence of glacially derived particle plumes. Particularly in the Southern Ocean, where DFe deficiency extensively limits primary production (Martin et al., 1990, 1991; Moore et al., 2013), and icebergs cause chemical and biological enrichment of surrounding waters (Smith Jr. et al., 2007; Schwarz and Schodlok, 2009; Smith et al., 2011), a change in iceberg Fe supply could significantly affect marine primary productivity. In the Arctic, iceberg-borne sediment is known to be lost from icebergs faster than ice volume (Mugford and Dowdeswell, 2010) due to its association with basal ice. A model for Kangerdlugssuaq Fjord (Greenland) shows that whilst icebergs lose 20–30 % ice volume within this fjord, the corresponding in-fjord sediment loss is 70–85 % (Mugford and Dowdeswell, 2010). In-fjord iceberg volume loss should correspond to a disproportionately high loss of iceberg embedded sediment (Mugford and Dowdeswell, 2010), and thereby also FeAsc and TdFe. Generally in the Arctic, a sharp decline in the mean FeAsc and TdFe per volume of meltwater from icebergs with time after calving would be expected due to the preferential loss of iceberg basal ice, as modelled by Mugford and Dowdeswell (2010). Icebergs should thus constitute a source of the micronutrient Fe to offshore polar waters (Raiswell et al., 2008). FeAsc leaches were conducted on wet sediment as per Raiswell et al. (2010), with leached Fe determined by measuring absorbance (λ = 562 nm) before and after the addition of ferrozine (as detailed in Supplementary Information Methods). Whilst dried sediment exhibits a rapid decline in FeAsc wt. % (Raiswell et al., 2010), it is not clear how storage of ice or wet sediments affects FeAsc. ‘FeAsc’ is the ferrihydrite content of sediment, defined by Raiswell et al. (2010). Whilst TdFe data for icebergs is sparse, iceberg FeAsc content has previously been estimated in multiple catchments worldwide (Raiswell et al., 2016) producing a mean global content of 2.7–17 µM. However, FeAsc content and offshore iceberg FeAsc fluxes are normally calculated using a mean sediment loading (0.5 g L-1 is widely used as outlined in Raiswell et al. (2016)) with considerable uncertainty generally acknowledged in this value. Sediment loss should also affect mean FeAsc content in the same way, however FeAsc losses may be offset from TdFe losses if significant processing of surface sediment occurs on the timescale of iceberg Fe delivery (Raiswell et al., 2016). In Kongsfjorden, Raiswell et al. (2016) reported a FeAsc range of 0.016–0.37 wt. % (n = 14), with a mean of 0.14 wt. % and median of 0.092 wt. %; equivalent to 1.4–33 µM, 12 µM and 8.2 µM, respectively when using the suggested mean sediment loading of 0.5 g L-1. Table 1 [...] *The suggested 0.5 g L-1 sediment loading is used for data from Raiswell et al. (2016). All ice samples were collected from calved ice masses within Kongsfjorden east of 11.89° E. Sampled icebergs had a maximum length (visible above the waterline) of between 0.4 and 20 m, and a maximum height above the waterline of between 10 cm and 4 m. For FeAsc, icebergs with visible sediment layers (darkened layers approximately 0.5 to 5 cm thick) were targeted whereas sample collection for DFe/TdFe was random. To measure FeAsc, 1–2 kg ice pieces were returned to the laboratory in insulated plastic boxes. As a precaution against contamination, ice was rinsed with de-ionised water (Milli-Q, Millipore, conductivity 18.2 MΩ cm-1). Ice was then melted in low density polyethylene (LDPE) bags with the first (1–2 hr later) meltwater discarded. After melting ice overnight, the total volume was recorded and then excess water was removed slowly (<5 mL min-1) by filtration (0.45 µm, polyvinylidene fluoride, Millipore) to concentrate the sediment. All plastic vials and filtration equipment for sediment collection/handling was pre-cleaned (1 M HCl, 3 de-ionised water rinses) prior to use. FeAsc was determined as per Raiswell et al. (2010) but using larger (~100 mg) sediment samples without sieving. Leached Fe was determined by measuring absorbance (λ = 562 nm) before, and after, the addition of ferrozine (Stookey, 1970) using a 1 cm cell with a USB4000 Fiber-optic Spectrometer and a LS-1 tungsten halogen light source (Ocean Optics). Fe standards were made by spiking DFe from an acidified (pH 2) 1 mM Fe stock solution into aliquots of ascorbic leaching solution producing a linear response (R2 > 0.99, derived molar adsorption coefficient 24,500 M-1 cm-1) over the absorbance range 0–0.6. Sample absorbance was then corrected for background absorbance and dilution by reagents. A sub-sample of sediment was retained (except for sediment loadings <0.1 g L-1 where this was not possible) and air dried to constant mass in order to calculate FeAsc content g-1 (of sediment) and L-1 (of meltwater). FeAsc measurements were duplicated for 11 randomly selected samples producing a relative standard deviation of 4.5 %. The propagated standard deviation for FeAsc L-1 of meltwater (obtained from combining sediment load with FeAsc wt. %) was approximately 15 %. 125 mL LDPE bottles (Nalgene) were pre-cleaned in a 3 stage process with 3 de-ionised water rinses after each stage (detergent, 1.2 M HCl, 1.2 M HNO3). After melting ice in LDPE bags, as above, 125 mL meltwater was retained without filtration for TdFe, and 125 mL was syringe filtered for DFe analysis (0.20 µm, polyvinylidene fluoride, Millipore). TdFe and DFe samples were acidified (with HCl, UPA, ROMIL) to pH < 2.0 and subsequently stored for 12 months to ensure complete recovery of soluble Fe (Edwards and Sedwick, 2001). DFe and TdFe were analysed by ICP-MS (ELEMENT XR, ThermoFisherScientific) after dilution with 1 M HNO3 (distilled in house using a DST-1000, Savillex, from SPA grade HNO3, ROMIL) and calibrated by standard addition with a linear peak response from 0–1000 nM Fe (R2 > 0.99). The analytical blank (DFe and TdFe) was always <0.6 nM Fe. To verify that the dilution technique yielded reproducible and accurate DFe results, NASS-7 and CASS-6 Certified Reference Materials (CRMs, National Research Council Canada) were analysed for Fe. Both CRMs yielded reproducible Fe concentrations within the certified ranges (Table S-1). A linear plot of all paired DFe and TdFe minus DFe (n = 28) yielded R2 = 0.78. However, R2 declined to 0.01 when the 3 highest TdFe data were removed. A Spearman Rank Order Correlation suggested there was no significant relationship between DFe and TdFe minus DFe (P value 0.21). A linear plot of all FeAsc (mol L-1) data and corresponding ice sediment load (g L-1) yielded R2 = 0.88. A Spearman Rank Order Correlation Coefficient of 0.95 (P value 2 × 10-7, n = 58) demonstrates that the relationship is significant and remains significant if the 3 highest sediment loadings are removed (Coefficient 0.94, P value 2 × 10-7, n = 55) - regardless of whether the sediment loads reported as <0.1 g L-1 are treated as 0.1 g L-1, 0.01 g L-1, or excluded. Statistics were performed in SigmaPlot 13. 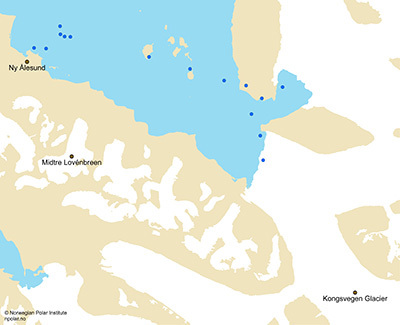 In July 2015, 15 samples of fjord surface water (depth <0.2 m) were collected by hand upstream of a small boat (locations shown Fig. 1). As per ice samples for DFe and TdFe, 125 mL was retained without filtration and 125 mL was syringe filtered for DFe analysis (0.20 µm, polyvinylidene fluoride, Millipore). Analysis was conducted via ICP-MS after storage for 12 months at pH < 2, and dilution with 1 M HNO3 (as per melted ice, above). The temperature and salinity of surface fjord water were recorded using a LF 325 conductivity meter (WTW) which was calibrated before use with a KCl solution. In July–August 2016 conductivity, temperature, depth profiles (CTDs) were acquired at 20 stations in the area of the fjord where ice was observed and collected (east of 11.89° E and proceeding to within approximately 400 m of each marine terminating glacier in Kongsfjorden, Fig. 1). Seawater temperature (recorded at 1 m depth) was consistently 4.0–5.0 °C. A broader range of surface temperatures were observed in July 2015 (2.6–8.8 °C at <0.2 m), but are not directly comparable because of the depth difference. Edwards, R., Sedwick, P. (2001) Iron in East Antarctic snow: Implications for atmospheric iron deposition and algal production in Antarctic waters. Geophysical Research Letters 28, 3907–3910. Stookey, L.L. (1970) Ferrozine- a new spectrophotometric reagent for iron. Analytical Chemistry 42, 779–781.